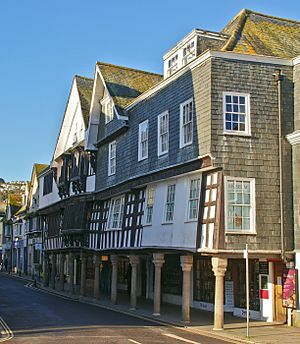 This page is about the town in Devon, England. For other places named Dartmouth, see Dartmouth (disambiguation). Dartmouth was of strategic importance as a deep-water port for sailing vessels. The port was used as the sailing point for the Crusades of 1147 and 1190, and Warfleet Creek, close to Dartmouth Castle is supposed by some to be named for the vast fleets which assembled there. 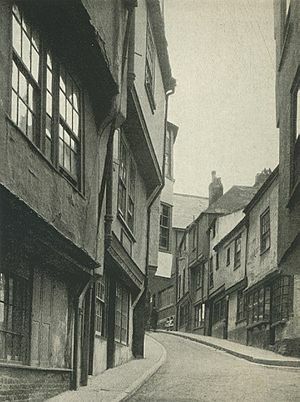 Dartmouth was a home of the Royal Navy from the reign of Edward III and was twice surprised and sacked during the Hundred Years' War, after which the mouth of the estuary was closed every night with a great chain. The narrow mouth of the Dart is protected by two fortified castles, Dartmouth Castle and Kingswear Castle. Originally Dartmouth's only wharf was Bayard's Cove, a relatively small area protected by a fort at the southern end of the town. St Saviour's Church was constructed in 1335 and consecrated in 1372. It contains a pre-Reformation oak rood screen built in 1480 and several monuments including the tomb of John Hawley (d. 1408) and his two wives, covered with a large brass plate effigy of all three. 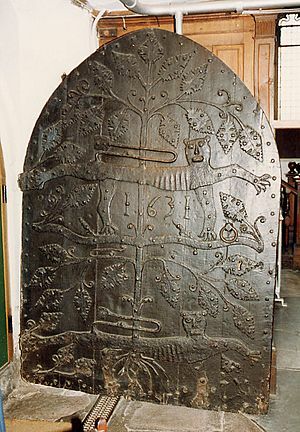 A large medieval ironwork door is decorated with two leopards of the Plantagenets and is possibly the original portal. Although it is dated "1631", this is thought to be the date of a subsequent refurbishment coincidental with major renovations of the church in the 17th century. The gallery of the church is decorated with the heraldic crests of prominent local families and is reputed to be constructed of timbers from ships captured during the defeat of the Spanish Armada, although this has not been categorically substantiated. In 1592 the Madre de Deus, a Portuguese treasure ship captured by the English in the Azores, docked at Dartmouth Harbour. It attracted all manner of traders, dealers, cutpurses and thieves and by the time Sir Walter Raleigh arrived to reclaim the Crown's share of the loot, a cargo estimated at half a million pounds had been reduced to £140,000. Still, ten freighters were needed to carry the treasure to London. Henry Hudson put in to Dartmouth on his return from North America, and was arrested for sailing under a foreign flag. The Pilgrim Fathers put in to Dartmouth's Bayard's Cove, en route from Southampton to America. They rested a while before setting off on their journey in the Mayflower and the Speedwell on 20 August 1620. About 300 miles west of Land's End, upon realising that the Speedwell was unseaworthy, it returned to Plymouth. The Mayflower departed alone to complete the crossing to Cape Cod. Dartmouth's sister city is Dartmouth, Massachusetts. The made-up embankment which today extends the whole length of the town's riverbank is the result of 19th century land reclamation, started in earnest when the town played host to a large number of prisoners of war from the Napoleonic Wars which formed a captive workforce. Before this, what is now the town centre was almost entirely tidal mud flats. In the latter part of the Second World War the town was a base for American forces and one of the departure points for Utah Beach in the D Day landings. Slipways and harbour improvements were also constructed. Much of the surrounding countryside and notably Slapton Sands was closed to the public while it was used by US troops for practise landings and manoeuvres. The Port of Dartmouth Royal Regatta takes place annually over three days at the end of August. The event sees the traditional regatta boat races along with markets, fun fairs, community games, air displays including the Red Arrows and fireworks. A Royal Navy guard ship is present at the event. Boat cruises to nearby places along the coast (such as Torbay and Salcombe) and up the river (to Totnes, Dittisham and the Greenway Estate) are provided by several companies. The paddlesteamer PS Kingswear Castle returned to the town in 2013. Dartmouth is linked to Kingswear, on the other side of the River Dart, by three ferries. The Higher Ferry and the Lower Ferry are both vehicular ferries. The Passenger Ferry, as its name suggests, carries only passengers, principally to connect with the Paignton and Dartmouth Steam Railway at Kingswear railway station. The nearest bridge across the Dart is in Totnes, some 11 miles (18 km) away by road. The A379 road runs through Dartmouth, linking the town to Slapton and Kingsbridge to the southwest and to Torbay to the east across the Higher Ferry. The A3122 connects Dartmouth to a junction with the A381, and hence to both Totnes and a more direct route to Kingsbridge. First South West provides local town bus services and links to, Plymouth, Kingsbridge. As well as Stagecoach Gold provides a luxury bus service to Torquay via Totnes and Paignton. 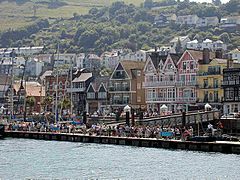 In addition Stagecoach Devon provides links to the Torbay resorts of Brixham, Paignton and Torquay from Kingswear via the ferry. 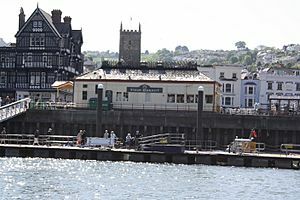 No railway has ever run to Dartmouth, but the town does have a railway station, although it is now a restaurant. 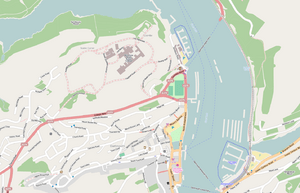 The railway line to Kingswear was opened in 1864, the original plans for the Dartmouth and Torbay Railway line took the line across a bridge and into the town. Opposition from local seamen and merchants saw the route diverted to Kingswear on the opposite side of the river, but this occurred after the station had been built at Dartmouth. 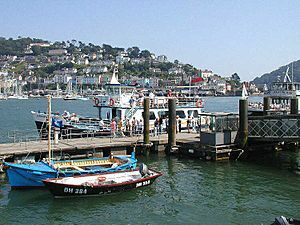 The railway terminated at a station called "Kingswear for Dartmouth" (now on the Paignton and Dartmouth Steam Railway) and a ferry took passengers across the river to the station at Dartmouth railway station, which had a dedicated pontoon. British Railways closed the line to mainline passenger trains in 1973, but it re-opened as a heritage line and has run as one ever since. Dartmouth, Devon Facts for Kids. Kiddle Encyclopedia.